Fig. 1. Expression cloning rationale. 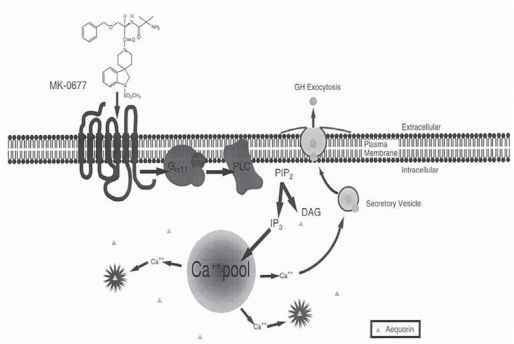 Schematic representation of GHS-R coupling to Ga11 and PLC leading to intracellular Ca2+ release, which can be measured with the photoprotein aequorin. improved receptor preparation procedures led to the identification of a GHS-R binding site (4,5). The GHS-R bound [35S]-MK-0677 with high affinity, and the rank order of potency of diverse peptide and nonpeptide ligands for [35S]-MK-0677 displacement correlated with their in vivo GH secretory activity. Based on its binding characteristics the authors assumed that the GHS-R was a G protein-coupled receptor (GPC-R) found in low abundance in the anterior pituitary and hypothalamus. This data facilitated the development of a strategy to clone the GHS-R (Fig. 1). The assay for identification of the GHS-R relied on the knowledge that GHS-R activation leads to G protein-mediated activation of phosphoinositol-specific phospholipase C (PI-PLC) and subsequent calcium mobilization.